"Should the office of the President of the Republic becomes vacant for any reason, the President of the Supreme Court of the Republic, or in his absence, the Vice President of that Court, or in his absence, the judge with the highest seniority and so on by order of seniority, shall be invested temporarily with the duties of the President of the Republic by the National Assembly duly convened by the Prime Minister- The election of a new President for a new five (5) year term shall be held at least forty-five (45) and no more than ninety (90) days after the vacancy occurs, pursuant to the Constitution and the Electoral Law." According to the judges of the Supreme Court, Haiti currently does not have a legitimate president. "Haiti is currently without a legitimate president. Mr. Privert’s term expired on June 15th, 2016 and he has remained in office without a mandate. Under Article 149 of the Constitution, the Supreme Court is charged with stepping in when the president is absent." Jocelerme Privert, then, president of the Senate, was selected by the Haitian Parliament as interim president of Haiti on February 14th, 2016, for a non-renewable 120 days mandate, after a week earlier, the 5 years constitutional mandate of Michel Martelly had expired without an elected president to take over. The first round presidential election Michel Martelly organized in October 2015, was widely seen as fraudulent; mass demonstrations forced electoral officials to scrap the entire result and start from scratch. Under the accord that installed Privert for a period of 120 days, new elections were set for April, but those elections were also delayed, as were 4 subsequent election dates. New elections were scheduled for October 9, 2016, but had to be again delayed due to devastation from Hurricane Matthew. On Friday, the Provisional Electoral Council announced elections for November 20; and many are already wondering if having a presidential election so soon after such a large scale disaster is even feasible at all. Concerns that the Supreme Court also evoked in its statement. "The Court is concerned that the announcement of elections scheduled for November 20th is a clear attempt to distort the election process. Hurricane Matthew devastated much of Haiti’s infrastructure making it impossible to hold elections in such a short time. Schools used for polling stations are damaged and a large majority of voters do not have identification cards to vote. Haiti is currently suffering a humanitarian crisis due to the high death toll, lack of food, water, medicine and the rise in cholera cases. By holding elections in the midst of a constitutional quagmire and so soon after a major hurricane, Haiti is in danger of repeating the October 2015 elections which threw the country into chaos. The Supreme Court is most concerned with restoring democracy in Haiti, protecting human rights, and ensuring economic and political stability. Based on this situation, the Supreme Court is meeting to analyze the situation and make recommendations." Could the Supreme Court remove Privert from power? Yes it absolutely can, unless the Haitian Parliament acts as soon as possible. After the 120 days mandate of interim President Jocelerme Privert expired on June 15th, parliament was suppose to convene in National Assembly to either prolonge the mandate or designate someone else to complete the electoral process, but their four attempt to do so did not result in an agreement or was boycotted by others. 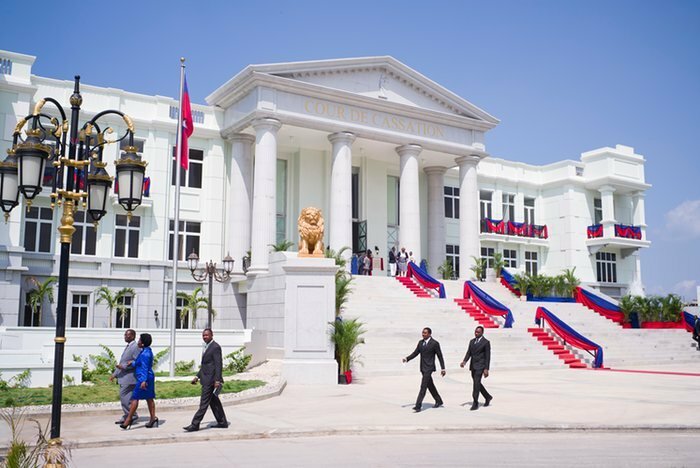 According to the French news paper Le Figaro, neither the US Embassy in Port-au-Prince nor the US State Department responded to comments request made by the Justices.